Hanna Seymour, a mentor to thousands of young college women, provides a plan for success in college based on experience, illustrations, and biblical principles. Each year millions of young women enter the college scene and are surprised to find their glittering preconceptions shattered. College isn't exactly what they had imagined--it's a lot tougher. Social challenges, a demanding schedule, pressure to succeed, shifting family dynamics: how do girls tackle these issues, learn to thrive, and really enjoy this new phase of life? 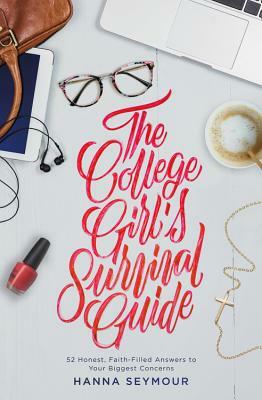 THE COLLEGE GIRL'S SURVIVAL GUIDE is packed with experienced-based advice that can help. Written by a mentor with ten years of experience helping college girls succeed, it's like having a big sister along for the journey. With proven tips, scripture, and inspiring illustrations, this book will coach, comfort, and inspire young women so that they can make the most of the college experience. Thousands of young women have asked Hanna Seymour what to do about roommate drama, boyfriend trouble, choosing a major, balancing family and school life, and so much more. She's poured her best insights into this book--answering the top 52 questions she has received--so that readers everywhere will be armed with the knowledge and inspiration to make college the most epic, enriching time it can be. For over ten years HANNA EASLEY SEYMOUR has mentored young women, helping them transition smoothly from high school to college and beyond. She holds a B.A. in Interdisciplinary Social Sciences from James Madison University and a M.Ed. in Higher Education and Student Affairs from the University of South Carolina. Combining faith with a passion for helping others, Hanna explains how to tackle problems with good sense and grace on her website, HannaSeymour.com. Hanna's voice to the college woman is that of a big sister and mentor with great wisdom and guidance. Her confidence and reassurance that you're not crazy, you're not alone, and it will all be okay is just what every woman needs. A must-read for every college-age woman before her first day on campus, and an incredible resource to refer back to.